At Cloud Vapor the vape is a passion, the taste is a priority. The Californian aromas are of high quality and the assembly is designed in compliance with European Standards. The recipes are made by aroma experts of Cloud Vapor in France. Acidic Red Fruits, Sweet Pineapple, and Watermelon Freshness. for a flavoured experience. A Strawberry-Banana Cocktail, surprising and creamy with notes of multi-coloured Fruity Candy! An explosive recipe of Fresh Blackberries, Lime and Raspberry to tickle your tastebuds. To be mixed in a base. Grapes, Litchi, Apple, Papaya.... the Cloud Vapor propose fruity and tasty recipes. The quality is created by passionates of vape. This is why, the recipes of Cloud Vapor E Liquids are though of tested and elaborated in France by a team of aroma experts. The Aroma Cloud Vapor is in compliance with European standards related to hygiene and food quality. The vapers have not mistaken and have immediately adopted the range of Cloud Vapor and the different fruity flavours. 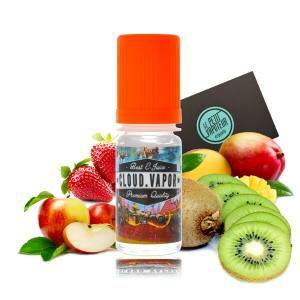 The recipes invented by Cloud Vapor propose a mixture of unawaited fruits and are more flavoured than others: Green Apple associated with Strawberry, Kiwi and Mango, the Kiwi rubs with Wild Fruits and Absinth, the Litchis are married with Pomegranate. 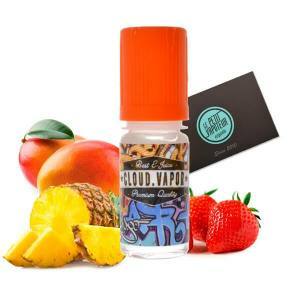 Certain vapers can choose the Cloud Vapor E Liquid for all days.